Decapods are a diverse taxonomic order of the subphylum Crustacea, and most commonly known members include crab, shrimp, and lobsters. All decapods possess five pairs of walking legs, as the name implies, but each species uses them in unique ways, suited for that individual's purposes. There are approximately 15,000 known species of decapods and more still are being discovered. Decapods, being members of the subphylum Crustacea, have a jointed exoskeleton, two pairs of antennae, a pair of mandibles, a pair of compound eyes, a pair of maxillae on the head, a body split into three major segments, and breathe through gills. Additionally, all arthropods have metameric segmentation, though many arthropods have widely specific and variable segments.Decapods are a diverse group, some shrimp species ranging in size from under to half a centimeter to the coconut crab, which can reach lengths of 6 ft, and weigh up to 38 pounds. As their name implies, Decapods have 5 pairs of jointed walking legs on their abdomen body section, which is the defining characteristic of this class. Additionally, the first three segments of the thorax and the head are fused together and make up the cephalothorax. The crab's life cycle is accomplished in three states. After a female's thousands of eggs are fertilized by a male, the mother moves into the water to give birth to zoea, which are microscopic crab larvae. In this state, the zoea can swim about freely and eat small organisms and feed off of nutrients in the water. After a zoea matures, the crab larvae turns into a megalopa, a state which resembles an adult, but has a tail that protrudes from the posterior of the crab. From this point, the crab molts frequently and grow to be full size, the rate of maturity varying among different species. Once a crab reaches adulthood, gender specific characteristics begin to develop and create a distinct difference between sexes. Additionally, many decapods such as crab, lobster, and shrimp, are food for humans as well. In 2012, Alaskan harvests alone amassed over 100 million pounds of crab, but at the height of the industry, over 400 million pounds of Alaskan crab alone were caught. Fisheries in Alaska processed over 200 million pounds of crab. Shrimp, a commonly consumed decapod, brought in just under 5 million dollars in 2012 for Alaska. Shrimp species are fairly uniform in body and dietary habits, but the color varieties and patterns are widely different and come in almost every design imaginable. Species such as the Fire shrimp (Lysmata debilius) and the Cardinal Shrimp (Caridina dennerli) are brilliant and vibrant shades of red, while the American Ghost Shrimp is almost completely transparent. Oddly structured shrimp species include the Horseshoe Shrimp, which resembles a Horseshoe Crab, has a rounded, flat carapace with its long segmented body protruding from the end. This short video highlights the Dresser crab, Naxia Tumida, an unusual crab with the ability to camouflage itself in any environment. This crab uses its unique ability to avoid detection by predators, and well demonstrates the variety of species within the Order Decapoda. ↑ Decapoda Wikispecies. Web. Last updated 29 September 2013. ↑ Myers, Phil. [animaldiversity.ummz.umich.edu/accounts/Crustacea/ Crustacea] Animal Diversity Web. Web. Accessed December 15, 2013. ↑ 3.0 3.1 Preuss, Simone. The Largest Crab on Earth Environmental graffiti. Web. Last accessed on 13 January 2014. ↑ Fox, Richard. [lanwebs.lander.edu/faculty/rsfox/invertebrates/callinectes.html Blue Crab with notes on Cancer] Invertebrate Anatomy Online. Web. Published 30 May 2007. ↑ Characters_and_Anatomy. Palaeobiology and Biodiversity Research Group. Web. Accessed on 15 December 2013. ↑ Crabs of Japan. Marine Species Identification Portal. Web. Accessed on 15 December 2013. ↑ Autonomy and regernation of limbs in the male blue king crab Paralithodes platypus from the Bering Sea and the Sea of Okhotsk Springer Link. Web. Published 1 September 2000. ↑ Angel and Clare. Crab Diet Rockburn. Web. Published during the 2001-2002 school year. ↑ Whitaker, David. Shrimp Life Cycle Department of Natural Resources, South Carolina. Web. Last Accessed 13 January 2014. ↑ Life Cycle Fiddler Crabs. Web. Last Accessed 14 January 2014. 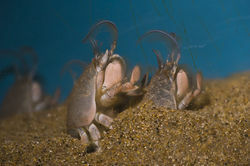 ↑ 12.0 12.1 Malacostraca - Decapods Marine Education Society of Australia. Web. Last Accessed 13 January 2014. Author Unknown. ↑ What Eats Shrimp? What Eats?. Web. Published April 6, 2010. Author Unknown. ↑ Shellfish Commercial Fisheries Alaska Department of Fish and Game. Web. Last Accessed on 13 January 2014. Author Unknown. ↑ Coconut crab (Birgus latro). ARKive. Web. Last Accessed on January 13, 2014. Author Unknown. ↑ Japanese Spider Crab. Cold Water Quest. Web. Last Accessed on January 13, 2014. Author Unknown. ↑ World's Most Beautiful, Colorful and Unique Shrimps. ABC's of Animal World. Web. Published 17 December 2011. Author Unknown.